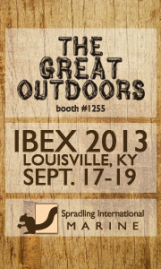 GRAND RAPIDS, Mich. - Sept. 11, 2013 - PRLog -- Spradling International Marine (SIM) will be exhibiting at the 2013 International BoatBuilders’ Exhibition and Conference (IBEX) Sept. 17-19 in Louisville, Ky. IBEX is an opportunity for boat builders, designers, distributors and dealers in the marine industry to showcase new innovative products. SIM has prepared a presentation of eco-friendly products and ones that reflect nature’s color palette. These products will be on display in SIM’s “Great Outdoors” themed booth. During the exhibition, IBEX will award their prestigious Innovation Award. This year, SIM has entered three marine products. The first is patent-pending “Compass HB” floor covering. Considered to be one of the most “innovative floor coverings to be introduced to the marine industry in years”, Compass is constructed using woven PVC and polypropylene yarns. Its covering protects against fading, degradation, mold and mildew, and stain resistant for easy maintenance. SIM has also entered “Very Low Profile Clip” from Fastmount™. Designed for applications with less depth and minimal framework, these invisible fixings install, remove and refit for easy repair. The final entry is eco-friendly Hi-Loft3R™ backing. It is made from Repreve®, a 100% recycled polyester yarn, which in 2012 kept more than 900 million plastic bottles from filling landfills. Hi-Loft3R™ is a part of the first Pink Stain warranty offered to the marine industry. Winners will be announced during the Industry Awards Breakfast on Tuesday, Sept. 17, 2013. To learn more about IBEX visit their website at: http://www.ibexshow.com/index.php. To learn more about Spradling International Marine at IBEX visit the Spradling International Facebook page.